On any given day, Australian non-profits blanket the streets and parks of capital cities to solicit regular gifts from passersby. I never get stopped by those soliciting for health, environmental, international aid, and other types of charities. Does age define who gets solicited by nonprofit street canvassers or face to face fundraisers? Street canvassers are typically very young adults, approximately 18-25 years old. Dressed in t-shirts bran ded with the charity name, they often struggle to get people to stop to have a conversation with them. Some people do anything they can to not engage with the canvassers. I try to have eye contact with the canvassers and do everything possible to see if they will engage with me. Instead, the canvassers look down and wait for their next prospect! Is it my age? At 55 years old, have I “aged out” of the target audience for canvassers’ interest? People aged from 40-65 years old likely have stable income to offer Australian non-profit organisations. Yet, I see the street canvassers stop people in their own age bracket and let those 40-65 pass them. I suspect those in their own age bracket have far less disposable income and, perhaps, less capability and likelihood to give a donation on a credit card on a monthly basis. If the young passersby are likely to stop, have a conversation with their peer, and agree to a monthly donation, they may have buyer’s remorse and cancel the donation at a higher rate than older adults with a more stable financial background. Are street canvassers more comfortable talking to people there own age? Do they have a higher success rate signing on people their own age than someone older? Is the retention rate the same for both age groups? Have any fundraising firms or nonprofit organisations studied this matter? Do you have thoughts about target audiences for street canvassing? It’s the Tuesday following US Thanksgiving, Blackbaud Friday, Small Business Saturday, Cyber Monday. That means it’s #GivingTuesday, Australia. What are you planning to do for #GivingTuesday? Have you had plans in place to execute for many months? Or, have you planned nothing at all? #GivingTuesday is a unique opportunity for charities, suppliers, and donors to come together to boost charitable giving in one day and to do so world-wide. You can do as little or as much effort as you live. The beautiful part is the day falls smack in the middle of our Christmas appeal season in Australia. So, why not test the waters to see if it makes a difference for your non-profit organisation. How can you charities, suppliers, and donors come together and get involved? Create a day-long social media campaign to promote giving to your Christmas or year-end appeal. Push donations online. Conduct a one-day calling program to acquire new donors, renew past supporters, and upgrade those who are regular donors. Get an army of volunteers to join you by calling to thank donors who have already supported your Christmas or end of year appeal. Give to your non-profit customers Christmas or end of year appeals. Volunteer for the day at a local homeless shelter or other charitable organisation. Give 10% back on all invoices for the month f December. Volunteer for a charity today or this evening – something you have been meaning to do for a long time. Sign up to be a regular volunteer at the charity of your choice. Become a regular donor to a charity of your choice. Gather all the loose change you have and drop it off at a charity in your neighbourhood. Clean out a closet and drop the clothes at Vinnies or Salvation Army so they may be sold to another loving home. You see, #GivingTuesday does not need to be well planned and executed. Although, it helps increase your results if you do plan the activities and steps! #GivingTuesday can be the smallest acts of kindness or a large-scale campaign. #GivingTuesday is what you make it. You conducted a Constituent Relationship Management (CRM) search, picked the best CRM platform and a terrific CRM supplier. You think your work is done? 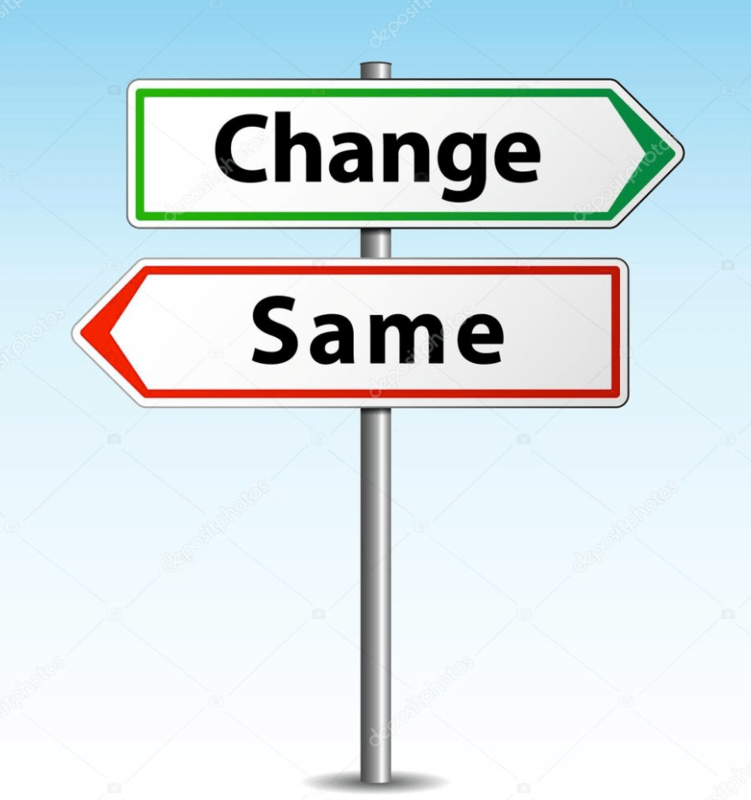 Often times a non-profit organisation will believe the bulk of the work for a CRM implementation falls on the implementation partner or the supplier? Nothing could be further from the truth. The fact is the work is a shared responsibility and it is important for a charitable organisation to understand the need to put a proper team in place for a non-profit CRM implementation. 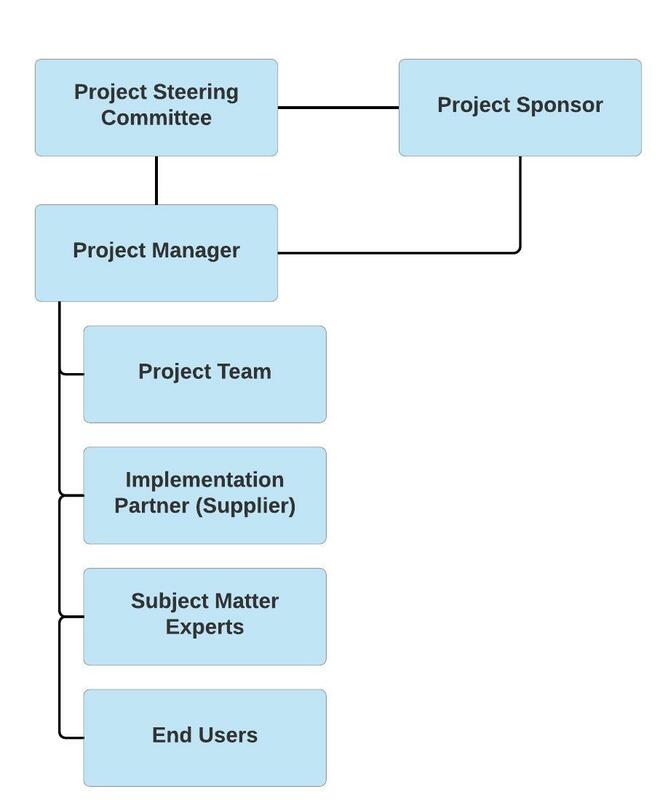 Project Steering Committee– A Project Steering Committee is a committee that decides on the priorities or order of business of a project and manages the general course of its operations. Sometimes the Implementation Partner will sit on the Project Steering Committee, offering the chance for the Steering Committee to have internal and external Steering Committee meetings including this person or excluding this person. The Project Steering Committee will meet one time per month. The Project Sponsor leads the Project Steering Committee. (4-5 members). Project Sponsor – The Project Sponsor is the individual (often a manager or executive) with overall accountability for the project. The Project Sponsor is primarily concerned with ensuring that the project delivers the agreed business benefits. (1 person). Project Manager– A Project Manager is a professional in the field of project management. Project managers have the responsibility of the planning, procurement and execution of a project, in an undertaking which has a defined scope, defined start and a defined finish. The Project Manager will be engaged for the duration of the project. The Project Manager reports to the Project Sponsor and to the Project Steering Committee. The Project Manager often times has a Project Manager counterpart at the Implementation Partner (Supplier). (1 person). Project Team– A Project Team is a team whose members usually belong to different groups, functions and are assigned to activities for the same project. A team can be divided into sub-teams according to need. Usually project teams are only used for a defined period of time. A project team may include people representing cross organisation portfolios or departments. The Project team will meet weekly. (6 persons). Implementation Partner (Supplier) – The Implementation Partner will be the partner chosen amongst the suppliers who will implement the chosen CRM platform and meet the business requirements and objectives of the organisation and the project. The Implementation Partner will be engaged for the duration of the project. (1 supplier). Subject Matter Experts– A Subject-Matter Expert (SME) or domain expert is a person who is an authority in a particular area or topic. The term domain expert is frequently used in expert systems software development, and there the term always refers to the domain other than the software domain. The SMEs will be engaged for the duration of the project, but will be called on only as needed. There will be peak times when the SME is engaged more frequently. (1 person per portfolio or department). End Users– An End User is a person who will utilise the product developed or configured by the parties involved in a project. There will be many end users and various end users who are consumers of the outcome of this project. Each End User audience will be important to those involved. (There will be many, many users/stakeholders in the project). Time and Effort Required – The only person committed to this project for a set number of hours per week for the duration of the project is the Project Manager. However, everyone will have demands on their time and have to put in a certain amount of effort in order to ensure project success. Scheduling – Examine potential conflicts across the project. A schedule of conflicts, including projects and holidays should be developed. Use this as a template. Fit – Consider the right fit for each role. Ensure everyone is of the right mindset and has a collaborative personality. The success of a non-profit CRM implementation project is dependant on the infrastructure you put in place at the outset. Don’t skimp on the planning stage of a project. Ensure you have the right teams with the right people in the right roles in place. Customer Service – what does it mean to non-profit organisations? Customer service failures are easily identifiable. Think about a time when you became agitated with a company you were dealing with as a consumer. Was it an airline, an online store, a retailer, a hotel, or a restaurant? What got your blood pressure up? How could this customer service experience have been prevented? You and I do not put up with poor customer service as consumers. If we receive poor customer service, we likely complain directly to the supplier via letter, email, phone, or, even, Twitter and other more public channels. In the NFP sector, why would donors put up with a charity and why would non-profits put up with suppliers who are not on top of their customer service game? I had a conversation yesterday with a customer about what it means for a supplier to deliver good customer service to the NFP sector. We talked about the great customer service NFP suppliers deliver pre-sales; however, once the purchased is signed, the solid customer service goes out the window. We talked about companies who serve our sector and how little customer service is delivered, especially on a pro-active basis. We also talked about the fact that often smaller suppliers deliver far more superior customer service than the larger suppliers. What must each of us do to ensure those things do not occur in our organisation or business? Good customer service begins at home. Your team – whether in a charity or supplier to NFPs – need to consider their work colleagues to be their customers. We need to be responsive of one another in meetings, email, and other forums. A positive atmosphere is infectious, as is a poisonous atmosphere. When customer service is delivered to one another, it spreads to our external customers – donors or charities. Turnaround time. We should expect to hear back from one another within a business day when there is not a holiday or sick leave situation. When a day’s turnaround time is not possible, set expectations with the “customer”. Be clear about length of time and, perhaps, reasons why it may take you a bit longer. Keep the consumer informed about your progress. Gift entry/acknowledgement. Charities should be responsive to donors when a contribution is received. How does your organisation measure up? You don’t know? You should. Processing a gift and returning a receipt/acknowledgement within 48 hours is critical. I have said it before. You and I cannot control the amount of time it takes Australia Post to get the donation to the charity. Likewise, we cannot control the amount of time it takes Post to get the thank you letter to the donor. Therefore, we must control the length of time the gift is in our custody. Processing time must be measured, goals set, and KPIs monitored. Friendly, upbeat greetings. Whoever is on the telephone or greets visitors to your organisation needs to be friendly and upbeat at all times and no matter the distractions. Remember the old saying that you do not get a second chance to make a first impression? Use that rule at the reception desk. Do Not. As a member of a team, you cannot blame others for not being able to respond in a reasonable time frame. Additionally, do not tell people you are “flat out” and cannot complete their task. Doing so makes it seem like you believe they, too, are not busy. We are all busy. And, doing so also diminishes the importance of their task! Absence won’t make the heart grow fonder. Be sure to have constant coverage and even during holiday and sick periods. Do not assume your donors or customers will understand and will simply wait for their key contact to return. Set out of office messages on the phone and email systems. Be proactive. Reach out to your donors in between asks. Check in with your donors just to see how they are doing. Suppliers should do the same. Suppliers should reach out to NFPs to share ideas, discuss how other customers have overcome a challenge. The hard stuff. Having difficulty accomplishing the hard stuff should not prevent us from delivering good customer service and it should not prevent us from accomplishing the day-to-day, more routine, items. If a donor or a customer, in the case of a suppler, asks something that cannot quickly be answered or, perhaps will require a bit of research, set clear expectations about the timeline it might take to get an answer. 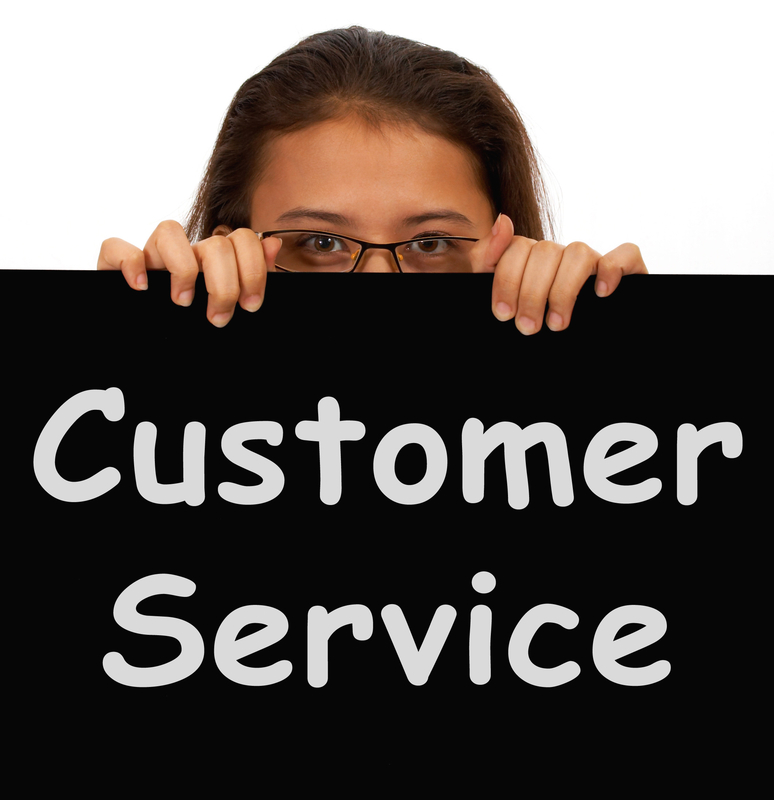 Good customer service levels do not have to be difficult to achieve. Start at home; repeat it to your external audiences; set metrics for turnaround time; ensure friendly and upbeat atmosphere at the point of reception; do not blame others and do not use the “flat out” excuse; fill gaps in staffing during holiday and sick periods; and don’t let the hard stuff get in the way of the more routine items. Following these simple tasks will let you, as a non-profit or a supplier in our space, shine throughout the year. The first charity Christmas appeal received from…. It’s something I report on each year via the FundraisingForce blog. The first charity Christmas appeal was received from…The Salvation Army. The Salvation Army has been the first for the past several years. I’ve talked about the need for a charitable organisation to stand out in the letterbox in several past FundraisingForce blog posts. It’s really the key to successful direct mail. Your piece has to stand out amongst all the postal mail one receives. If the letter does not get opened, it is not going to get a response. Salvation Army stood out in my letterbox because it arrived in early October and it was the first charitable organisation to send me their Christmas appeal! The organisation also stood out amongst my other mail because of the the art on the package. As in the past, the appeal is a Christmas Wish catalogue, which is full of items I can purchase to change the lives of those Salvation Army supports. Once purchased, I will receive a gift card and envelope to give to a person on my list to share the joy of giving. A simple concept and something that stood out in my letterbox the beginning of October. Many charitable organisations likely do not have their segmented direct marketing lists prepared and sent to their mailing house. Some may still be working on the letter copy, package content, and various approvals that go with the task. Where is your non-profit organisation in the process? 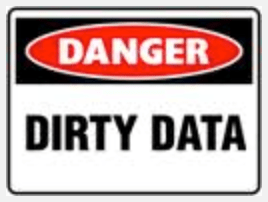 Is the data pull and the segmentation all a little too hard in your CRM? It does not have to be. Hire experts like FundraisingForce to properly segment your data and to create that segmentation inside your CRM. Once set up, this segmentation may be tweaked and pulled for appeals in the future. Don’t delay setting up your segmentation for your Christmas appeal because it is too difficult, too time consuming, or something you do not have knowledge to do. Let’s get the data ready so you can get the appeal in the mail and then you’ll be able to focus your time on other tasks – like assisting in the processing of the donations and the receipts! 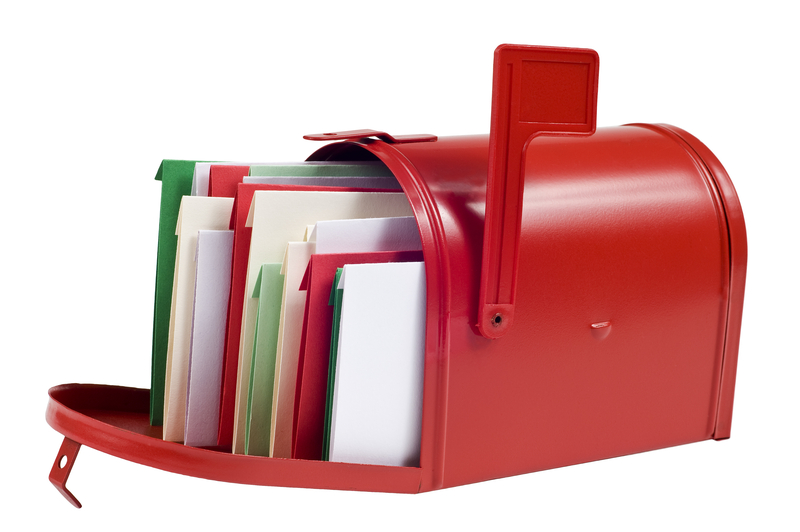 There have been lots of discussions about “excessive” premiums in charity direct mail lately. The conversation was raised in various circles, including at the Fundraising Institute Australia (FIA) conference, as well as during the development of the new FIA Code. Card packs, pens, shopping bags, and other items are sent to various prospective donors to entice them to give a first time gift to a charitable organisation. The fact is premiums work for some charitable organisations and premiums have proven to be a strong method to get people to give. On a recent visit to my parent’s in the United States, I found dozens of packs of address labels and other items sent to them from various veteran, healthcare, and other types of non-profit organisations. They have enough address labels to wallpaper a small bedroom. Who decides what is excessive? Should the cost of the premium item for a direct mail donation be deducted from the value of the donation for tax purposes? The US follows a similar rule. How do charity lotteries fit into this discussion – i.e. the luxury automobiles, $1 million+ homes, boats, and lavish holidays that are given away by hospitals, medical research, and other types of non-profits? Does the ratio of those luxury prizes to the cost of the ticket mean they are excessive? In interest of full disclosure, I am a big fan of charities using premium packages for their direct mail and they cause me, as a private donor, to respond. I have seen some fairly create premium packs used by some key direct mail suppliers in the Australian marketplace. That said, the debate is worth having and this discussion is worth the calories. I purchase many lottery tickets from the likes of the Mater Foundation, MS Queensland, RSPCA NSW, and others. Also, in interest of accuracy, FIA chose to remove clauses related to excessive premiums from their Code. These young people were passionate not only about being there in the fight against brain cancer, but who were also looking for a nice evening out. A spectacular food and drinks package for guests at the event. An exciting raffle with outstanding prizes, such as return business class airfare to Bangkok, Los Angeles, and London. Prizes were donated by Qantas and Virgin Australia, amongst others. A fun photo booth sponsored by Virgin Australia. A group of family and friends who had their hearts in the right place. The Sydney Spring Ball is a joint initiative of Cure Brain Cancer Foundation and the Wolfy Foundation for Sydney’s savviest. Their aim is to raise awareness and funds for brain cancer research and to honour David Wolf, who passed away from brain cancer at age 23, and all others who are affected or have been affected by brain cancer. 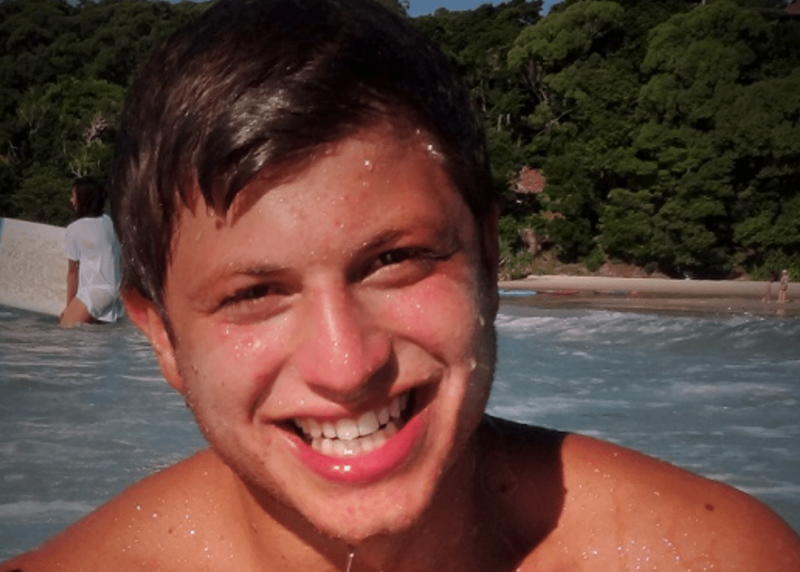 David’s family and friends have become deeply engaged in fundraising since his death and are doing everything they can to ensure other Australian families do not have to face the hurdles they faced. At this year’s event we learned that less than 10% of the Australian government’s money set aside for cancer research goes to brain cancer. Private support is critical in the battle against this horrific disease. Research can get us possibly to prevention and maybe even a cure in our lifetimes. The Wolf family’s initiatives are pretty spectacular. The Sydney Spring Ball had the complete package – the right mix of fun, education, and passion to young donors aged 23-30 to embrace the passion of the Wolf family and friends. It’s a case study every charity should explore. 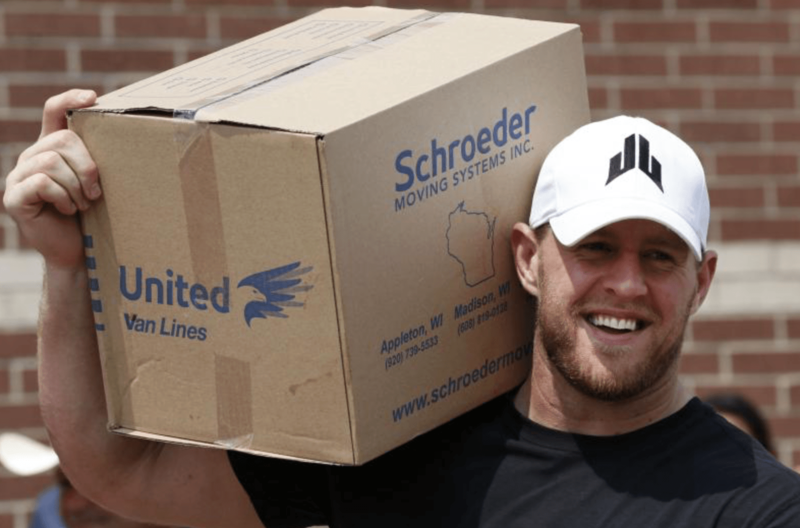 After watching the Houston Texan’s (and former Wisconsin Badger) JJ Watt lead a fundraising effort for the victims of Hurricane Harvey, the impact of video cannot be underestimated. It is obvious video is a fantastic partner when making an ask. Over the last ten days, JJ Watt , the US football hero, has used video to encourage people to give to JJ Watts Houston Relief Fund and he has also used video to applaud, encourage, and steward those who were supporting the effort. 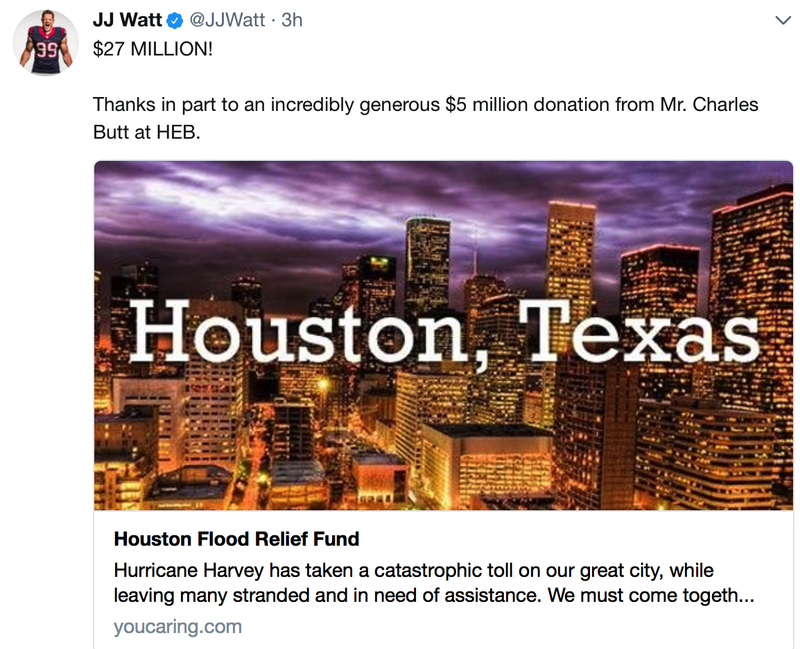 To date, JJ Watt has highlighted the fact that millions of dollars have been given to the hurricane relief effort through the Fund via a crowdfunding platform. The campaign has been so successful JJ Watt has had to increase the goal multiple times. Connects the charity or the cause to the audience. Inspire others to share a story or a cause. In this case, JJ Watt recorded an original message to get people to give and then he recorded regular updates where he expressed his gratitude for dollars raised and educated donors about where the money was going. These videos were shared on the Web via the Foundation’s Website and also via social media. Sure, JJ Watt is a national celebrity. Nonetheless, he took matters into his own hands and recorded the videos to prove the power and effective use of video. Not only have average people become engaged, but JJ Watt captured the attention of the media and of celebrities. People have been jumping on the bandwagon due to the personal nature of Watt’s approach. To date, Watt has raised over $27 million. And, he is not done yet. Most of us carry a video camera with us each day. Non-profit fundraisers can cut unprofessional, but personal, videos at any given moment. These videos are effective and and easy to deploy. There are also firms who produce very professional videos to tell our stories. There is one such firm which caters to the video needs of the NFP sector, Big Review TV/Big Cares. Big Review TV produces video packages for your non-profit organisation to use over the course of a year to bring the story closer to your prospective donors. Whether you need a video to get the word out immediately, such as the case of a disaster relief effort, or you want a full range video package to build your brand, increase awareness, and show the emotive nature of what you do, video is becoming a necessary component in our fundraising efforts. JJ Watt has given us a case study to learn from and encouraged us to put videos in our toolbox.